I’ve got all my bags packed and I’m ready to go to the hospital at the drop of a hat. I’m 38 weeks now and really I don’t know how it went this fast! If I don’t go into labor on my own, they will induce me on Feb 1 at 6am because of my gestational diabetes. So, I figured it was time to pack my bags and a bag of all the things for the new baby girl. I received this adorable Pink Lining Poppins Diaper Bag for review, isn’t it just perfectly adorable and fashionable?! Well, not only do I LOVE that this bag is fashion forward, it’s also a very functional diaper bag for when your on the go. There is a perfect place for everything you need for baby – 2 insulated bottle holders, 2 diaper pockets, a pen holder, key fob, a small zip pocket , a wet zip bag that I like to use for holding smaller items like diaper rash cream, first aid kits, medicines and all the other things that usually find their way to the bottom of the bag, oh and I can’t forget to mention the nicely padded changing mat. See what I mean? All the space, bags and tools you’ll need with baby! The lining is high quality nylon that can easily be wiped down and cleaned in the event of a spill. I really like that it has a space in the front zip pocket that is perfect for holding all my mommy stuff like keys, phone, a wallet and pen so it’s separated from all the baby gear. It really helps to keep me organized and not have to dig around a bottomless pit of a bag looking for what I need all the time. The strap is adjustable so it can be made for a perfect fit for over your shoulder or long enough to fit on a strollers handlebars. If your looking for a practical, spacious and stylish diaper bag I would highly recommend checking out the chic collection over at Pink Lining. They didn’t miss any details that are important to us moms and the patterns and prints are just too cute! Mine is all packed with all the hospital necessities and ready to go! I love it! So cute. Good luck when it’s your time. That is possibly the cutest diaper bag I have ever seen! Love it! If I have a girl I will definitely get a bag like this. Congrats! It is perfect! I really love the canvas strap and all the little areas provided for various items. This is super cute & looks homemade! 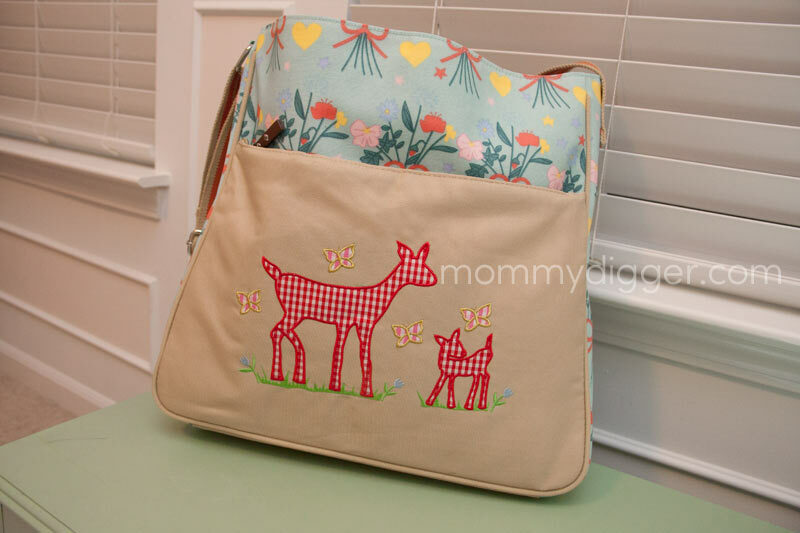 This is such a cute diaper bag!